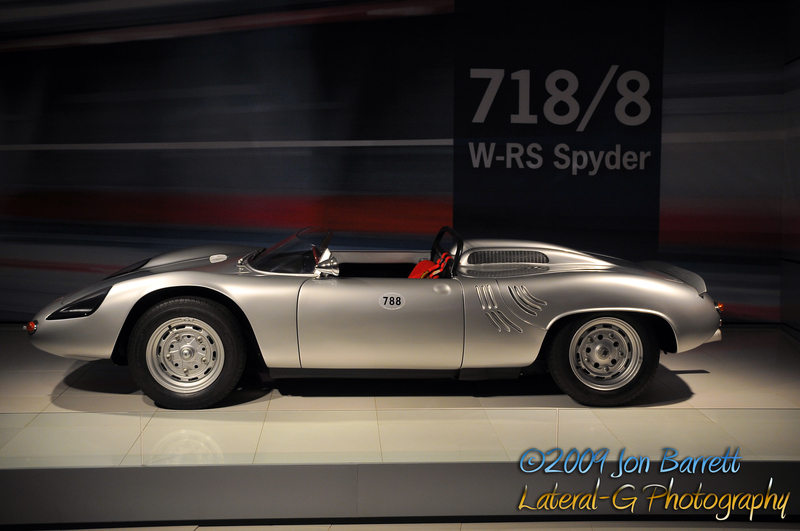 I call this one “Classic.” It is a stunning example of a Porsche 718/8 W-RS Spyder. Just an hour or so ago Ford pulled the cover off of the new Fiesta sub-compact car. Wow is this a good looking car in 5-door hatchback form (sedan isn’t quite as eye-catching). It was ushered in by Ford’s Fiesta Movement Agents and the whole unveil really was aimed at the Fiesta’s Gen-Y target audience. There was a live twitter feed on a projector where anyone that included “#fiestamovement” in their tweet could see it displayed over the satin covered cars – and you know I got my own tweet up there. The Fiestas themselves ranged from the factory stock cars to highly modified with my favorite being the maroon hatch that was turboed and lowered with Work wheels. I think Ford has really nailed it’s target audience and finally created a sub-compact econo-box the average person would want to buy. I can’t wait to see this go head to head with the new Mazda2 and maybe even see an SVT or, dare I say it, an RS version of the Fiesta. But as it sits, the standard car with its distinct styling and 40mpg highway fuel economy is nothing to laugh at. The Beetle is finally going to retire. Big news from the VW unveil is that the new version of the Beetle coupe and convertible will be its last. Yay! Now off to see the future of Soccer-Mom mobiles with the release of the new Toyota Sienna. The madness that is known as Press Days at the LA Auto show has begun and day 1 is packed with unveils. Chevy was first out of the gate promoting their new green technology including hydrogen fuel cell vehicles and their EREV (read “Not Hybrid”) Volt. They announced that California will be among the first markets to sell the Volt and it should come at the end of 2010. Chevy also unveiled their new compact sedan (coupe variant will be available too), the Cruze. First impression is very good. Well done exterior with some actual style to it and an overall sporty look. The interior is where the Cruze really struts its stuff. Finally getting away from over-plasticy, bland interiors, the Cruze features sweeping curves on its 2-tone dashboard and a very well laid out console. The engine isn’t too shabby either. GM is using one of its European turbo-charged 4 cylinders that promises a sporty driving experience and 40 mpg on the highway. At the LA Auto Show it is all about making an impression. Manufacturers create a big spectacle about all of their new cars no matter how minor they may be. The first day of Press Days is just starting and we are about to witness perhaps the biggest spectacle of all – a keynote speech by Bob Lutz. But why would a keynote speech be so spectacular? Because Mr. Lutz wasn’t the original speaker. Yesterday afternoon the industr was rocked with news that GM’s CEO and President Fritz Henderson, our Original keynote speaker, resigned his position with The General. This was a totally unexpected move and puzzled many people. Rumors abound as to the actal reasons behind Fritz’s act of seppuku but hopefully Bob “Maximum” Lutz will clear this up and shed some interesting light on what’s going on with GM and the auto industry in general. Currently conducting an American Muscle showdown. Who will win? Challenger SRT8 with its massive 6.1L Hemi? Camaro with its G8 derived chassis and independent rear suspension? Or the Mustang GT with its awesome blue paint. Place your bets.